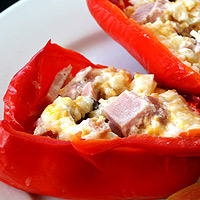 Ham, rice, and cheese fill these colorful peppers. When they are prepared like this, the whole family loves them! Heat oven to 400. Bring a large pot of water to a boil. Add 1 T salt. Using a sharp knife, core the peppers, carefully removing the ribs and seeds. Rinse the inside and out. Place in the boiling water and boil 1 minute. Remove and place top side down on a cooling rack to dry. 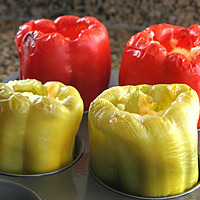 Try not to cut through the bottoms and sides of the peppers, so the filling stays inside and the pepper hold its shape. In a large bowl mix the remaining ingredients. Spray a large muffin pan with cooking spray. 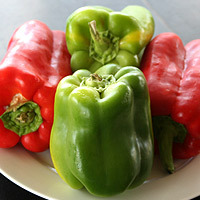 With a paper towel, pat dry the inside and outside of each pepper. 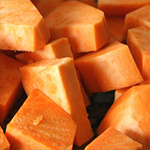 Boiling them before stuffing and baking helps them bake more evenly. 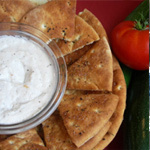 It also releases some of the excess liquid the pepper contains, giving them a better taste. 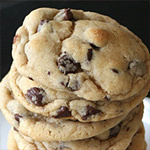 Baking them in a large muffin tin helps them stay upright while baking. It also allows heat ciruculation between the peppers, so they can bake evenly. Ramekins also work well. 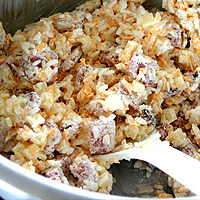 Place in prepared pan and stuff each pepper with the rice mixture, filling them to the top. They can be covered and refrigerated up to 24 hours at this point. 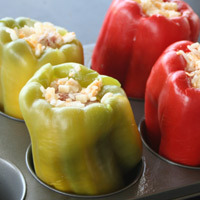 Bake for 15-20 minutes or until the peppers are soft and the filling is hot. broken peppers- if the peppers aren't carefully cored, the filling may bubble out and they may have a hard time holding their shape. 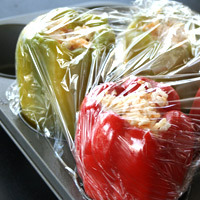 undercooked peppers- if the peppers aren't boiled first they take a long time to soften in the oven. They also won't bake as evenly. 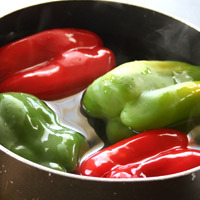 watery peppers- boiling the peppers also solves the problem of too much liquid being released into the filling while baking. 1. Heat oven to 400. Bring a large pot of water to a boil. Add 1 T salt. 2. Using a sharp knife, core the peppers, (1)carefully removing the ribs and seeds. Rinse the inside and out. Place in the boiling water and (2)boil 1 minute. Remove and place top side down on a cooling rack to dry. 3. 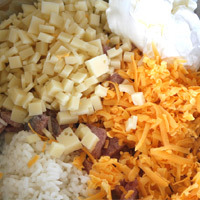 In a large bowl mix the remaining ingredients. 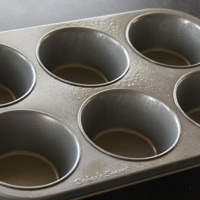 Spray a large (3)muffin pan with cooking spray. 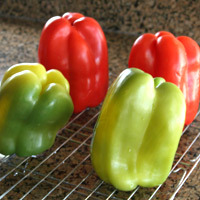 With a paper towel, pat dry the inside and outside of each pepper. Place in prepared pan and stuff each pepper with the rice mixture, filling them to the top. They can be covered an refrigerated up to 24 hours at this point. 4. Bake for 15-20 minutes or until the peppers are soft and the filling is hot. Serve immediately. 1. 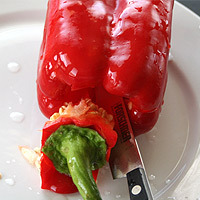 Try not to cut through the bottoms and sides of the peppers, so the filling stays inside and the pepper holds its shape. 2. Boiling them before stuffing and baking helps them bake more evenly. It also releases some of the excess liquid the pepper contains, giving them a better taste. 3. 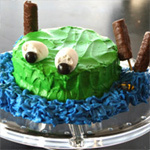 Baking them in a large muffin tin helps them stay upright while baking. It also allows heat ciruculation between the peppers, so they can bake evenly. Ramekins also work well.